Paul Joseph Watson is the Editor-in-Chief of the Jew ridden infowars, run by the rabid Jew shill Alex Jones, needs to do some fact checking before he shoots his mouth off. Then I discovered that the above quote actually did NOT come from Adolf Hitler. When I was reading Leon Degrelle’s book Hitler Democrat, it became clear to me that Hitler was actually very friendly to normal, honest business. I checked with a German friend of mine some time back about Hitler and his attitude to business. My German friend told me that Hitler BANNED chains of stores like we see in South Africa, the USA, etc. Hitler banned these Jewish chains of stores because they destroyed small businesses, especially family businesses! In my own lifetime I’ve watched how Liberal businesses DESTROY small white businesses here in South Africa. These big businesses bode no competition and they smash small entrepreneurs all the time. The same is true in the rest of the world. Hitler banned Jewish chains of stores so that family businesses could make a living. He believed that real innovation came from these small businesses run by one person or run by a family. So that makes Hitler UNQUESTIONABLY the most “small business friendly” leader in the history of the WORLD!!! Hitler also dealt with big businesses. During WW2 big German businesses came to Hitler with ideas and prototypes and the German Govt dealt with them. It turns out that Paul Watson tried to whack Hitler on Twitter by using the above quote. 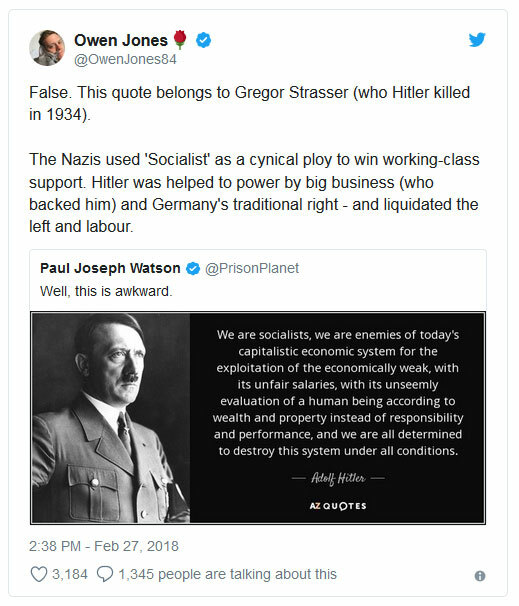 He was then caught out by Owen Jones! It turns out that snopes, whom I have no time for, and almost never quote, actually wrote a pretty decent article about this quote being wrong. Hitler never said this. I think the Jews are at work in this misrepresentation of Hitler. You’ll find some strange things regarding this quote. According to Snopes, the real person behind this quote is an early NAZI party official called: Gregor Strasser. Strasser was killed during the night of the long knives. But it seems Strasser was a highly talented individual and he wrote a fascinating pamphlet in 1926 wherein the above words can be found exactly as quoted above. I went to check and Google has a book called: Nazi Ideology Before 1933: A Documentation and in there on page 89 is this exact quote. (So unless Google has fiddled with the quote, it seems we have a reliable source). 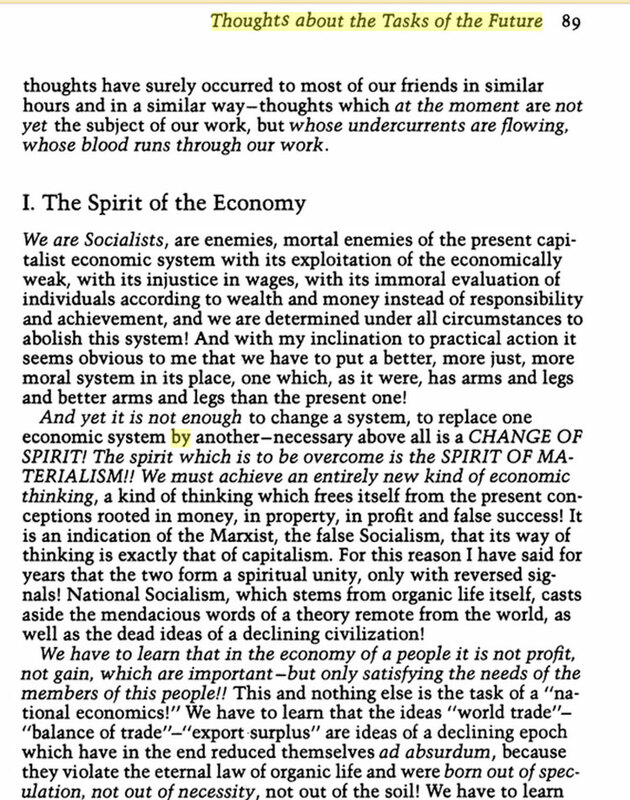 In that book is this section: “Thoughts about the Tasks of the Future”, by Gregor Strasser. Here’s a screen shot of the page where Strasser writes these words. It is directly under the heading: 1. The Spirit of the Economy. I like what strasser says about “fake success”. This is exactly what we see in the world today. Hitler did not go and smash the economy. He found ways of making things fairer and of allowing the upper and lower classes to co-exist happily. He did work to destroy the class structure, but not in the hideous ways that the Jewish Bolsheviks went about things. I’m not going to delve more into this now. It turns out that Strasser was a fine man in his own right. Strasser joined a revived NSDAP in 1925 and once again established himself as a powerful and dominant member, hugely increasing the party’s membership and reputation in northern Germany. Personal and political conflicts with Adolf Hitler led to his death in 1934 during the Night of the Long Knives. I’m not completely sure about the differences between Strasser and Hitler and the tensions between them. I get the impression that in the night of the long knives Hitler had to contain the more radical NAZIs in order to try to hold the nation together and to ensure that further revolution is carried out at a more gentle pace so as NOT to damage the country the way Russia was damaged by the slaughter of all the Russian Army officers. It seems to me that Hitler wanted to hold Germany together without the vicious killings that Jewish Bolshevism engaged in in Russia. He took control of his revolution so that things did not get out of hand, hence his (no doubt difficult) decision of who to liquidate during the night of the long knives. I’m going to quote the entire Snopes article about this post because it seems to be accurate and it explains where this lie comes from. You’ll see there are various fake claims made about Hitler. Hitler and the NAZIS cannot easily be called Left or Right by current terms. They did many things, and their entire paradigm was completely new, and, utterly brilliant actually. Hitler, like Mussolini, had to find ways to bring his people together to make them work as a Team, let’s say: #TeamWhite. He solved his problems in very creative ways and it worked well for Germany. It seems Strasser hated big business, but Strasser was Jew-friendly! And on those two points, he and Hitler differed totally! NB: Take note that Strasser also attacked the “frequent lie” of the Jews that people are “basically equal”. That Jewish nonsense was at work a century ago in Germany just as it is now at work all around the Western World. This is a fundamental Jewish lie that they use to this day to destroy whites. I marked important sections in the Snopes article in bold. 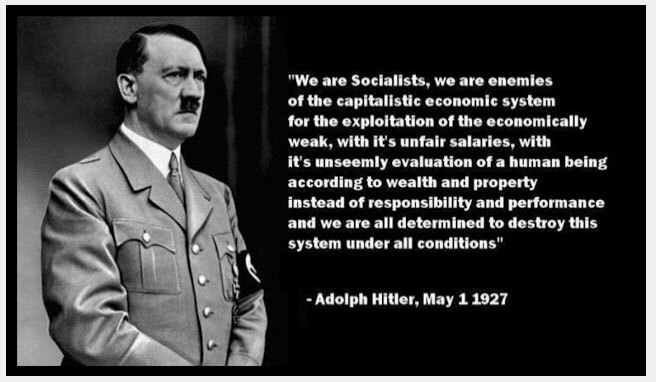 Did Adolf Hitler Say That Nazis Are ‘Mortal Enemies of the Present Capitalist Economic System’? While attributed to Hitler, this “leftist” quote actually came from one of Hitler’s political rivals. While Hitler may have co-opted elements of this language when it was politically expedient, they are not his words. Instead, these are the words of early Nazi party official Gregor Strasser, printed in a 1926 pamphlet titled Thoughts about the Tasks of the Future. That pamphlet, as we will discuss in detail below, attempted to appeal to ultranationalist movements on both the left and the right at a time when the Nazis were a fringe political party seeking to carve out as big a part of the German electorate as possible. 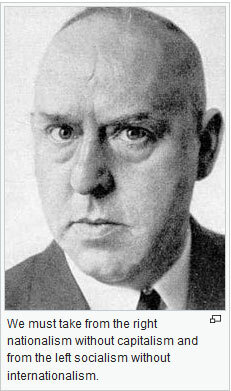 Gregor Strasser was a prominent Nazi propagandist in the formative days of the Nazi party. A World War I veteran active in post-war anti-Soviet paramilitary activities, he — along with Adolf Hitler — became one of the two most prominent voices for the party as it attempted to build a cohesive ideology and broad support across the various factions within a deeply divided Germany. The confrontation was most crucial in this period of National Socialism, for it encompassed basic matters of ideological orientation, organisation, tactics, and possibly leadership. Strasser was the guiding spirit of the ‘northern faction’, and he even put his authority behind a draft ‘socialist’ programme of action as an alternative to the one endorsed by Hitler for the party in 1920 which was supposed to be immutable. The fact that Hitler disagreed with Strasser’s view of “National Socialism” so much that he was killed in part for holding those views makes it all the more absurd to attribute this quote to Hitler, as Louder with Crowder has done. The post suggests that “this nifty thing called ‘history’ in combination with ‘the internet’” can “bust this myth” that Hitler was right wing. However, the web site takes a superficial view of German history based, in large part, on a comically misattributed quote. If anything, Louder with Crowder has made a strong argument for including some books along with that internet research. ← Video: Top Secret: What the Jewish code word Anti-Semitism really means!! capitalism is not free enterprise. Capitalism is not the friend of small business. capitalism destroys small business. Hitler supported small business but he unfortunately crawled into bed with all the big capitalists to.That’s what war causes.